The granite goliath inspires imaginative excursions for kids of all ages. A theory explained by author Richard Louv in Last Child in the Woods contends that the presence of many and different variables, or “loose parts,” sparks creativity. For children in particular, it makes open-ended, imaginative play possible. Nature is filled with loose parts, and Enchanted Rock State Natural Area has them in spades. Take rocks, for example. The namesake dome and others around it belong to a 62-square-mile batholith formation created more than a billion years ago when magma, or molten rock, oozed from far beneath the earth. The magma cooled and hardened into granite. For millions of years, the land around these bulges eroded away and exposed the domes. Since then, they, too, have been eroding, layer by layer, like an enormous onion peeled over millennia. Each exposed layer expands, splitting into sections that break into smaller pieces and slide off, leaving the next layer to crack and peel away. This exfoliation process has left rocks scattered around the domes, ranging from the size of houses down to gravel. 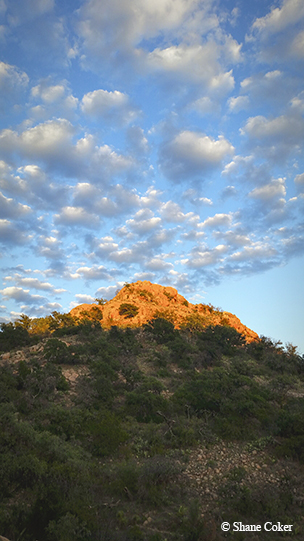 Turkey Peak, one of the five peaks at Enchanted Rock State Natural Area, catches the sun with clouds overhead. Park interpreter Scott Whitener calls these piles of rocks “nature’s playgrounds” and eagerly shows me his favorite. We walk about a hundred yards down the Loop Trail from the campground, turn right at a “Ground Fires Prohibited” sign, and follow a short, narrow trail to what rock climbers call the Carnivore Boulders. This jumble of enormous chunks of granite occupies children of all ages for hours, Whitener reports, with spaces to crawl through and surfaces to scramble up, clamber over and jump down. The higher spots offer great views, and secluded shady spaces among the boulders make nice picnic spots. Whitener confesses that he sometimes retreats here for a quiet lunch. From the Carnivore Boulders, we walk out onto Little Rock. While everyone needs to climb the park’s famous Main Dome at least once, Little Rock actually has more surface area and fewer people. In between these two domes is Echo Canyon, a loose-parts paradise: A trail of jumbled rocks leads down into a wide area shaded by tall trees and edged by two-story boulders practically begging to be climbed. From here, we glimpse Moss Lake before heading down the Base Trail. We follow this around the back of Enchanted Rock, between it and neighboring Freshman Mountain, past Frog Pond, back to the front of the Main Dome and the base of the Summit Trail. The Summit Trail threads upward through rocks and trees a short distance before opening up onto Enchanted Rock’s Main Dome. The dome covers 640 acres and rises 425 feet to a high point 1,825 feet above sea level, making the climb equivalent to huffing up the stairs of a 30- or 40-story building. On the slope, though, you can follow your own route — straight up, back-and-forth switchbacks or circling. The summit itself is a large area worth spending some time exploring. 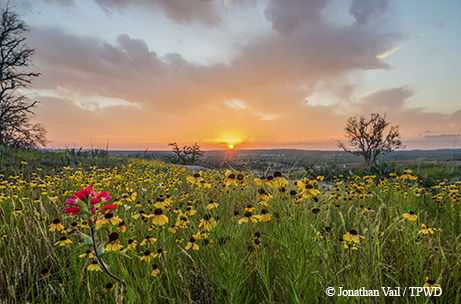 Hill Country wildflowers offer a splash of color in spring. Whitener points out weathering pits, where rainwater collects in level spots and wears away the granite faster than the surrounding rock. When water remains for several weeks, pits become vernal pools, little worlds of their own with unique plant and animal residents. Plants and animals provide a wealth of loose parts. Open oak woodlands contain trees such as post oaks, live oaks, blackjack oaks and Texas persimmons; shrubs such as agarita, whitebrush and prickly pear; and grasses such as bluestem, three-awn and grama. Mesquite grassland areas feature a variety of grasses, including Texas wintergrass, panicum and sandburgrass, along with mesquite trees. Floodplain areas along Sandy Creek have a mix of elm, pecan, hackberry, black hickory, soapberry and oak trees, along with shrubs such as agarita and buttonbush, plus grasses, sedges and herbs. Bluebonnets, Indian paintbrush, coreopsis, bladderpod, basin bellflower and other wildflowers bloom in all of these areas in the spring. Tiny, translucent freshwater shrimp live in the vernal pools, laying eggs that remain when the water dries out and then hatch once rain falls. Other wildlife common in the park include rock and fox squirrels — one helped itself to a can of nuts we foolishly left on the campsite picnic table — armadillos, rabbits and white-tailed deer. During our wanderings among the rocks, we see several crevice spiny lizards, about 4 inches long, with a pattern nearly matching the granite. Abundant bird life here includes energetic canyon wrens and colorful painted buntings and summer tanagers. Sandy Creek winds through the park on its way to the Colorado River. Even the sky above the park contains loose parts. We climb the rock in late evening to watch a glorious sunset and stay long enough to see the stars emerge. Enchanted Rock has earned Dark Sky Park designation from the International Dark-Sky Association; Whitener and other park staff lead occasional star parties. All you need are your own two eyes, and perhaps binoculars, to enjoy the spectacle of billions of stars, constellations and the Milky Way. No doubt many city kids see our beautiful galaxy for the first time here. Signs of history make for more loose parts. Prehistoric residents of the area thousands of years ago ground or pounded food on rocks throughout the park, leaving depressions in the granite called bedrock mortars. Spanish explorers who arrived in the area in the 1700s and Germans and Americans following in the 1800s all left their marks; the park contains more than 400 protected archaeological sites, 120 of them designated as State Archaeological Landmarks. Rangers occasionally offer programs on archaeology. The Nature Conservancy of Texas purchased this land from Charles Moss and deeded it to the state in 1978, rescuing this iconic landmark from having faces carved into it Mount Rushmore-style, a funicular to the top or other decidedly un-natural suggested amenities. Instead, it officially opened as Enchanted Rock State Natural Area in October 1978 and now sees more than 250,000 visitors a year. Everyone, it seems, enjoys loose parts. Park Hours: Open daily 8 a.m. to 10 p.m.
Park rules regarding pets and trail hours have changed. Please visit the website for details. Best time to visit? Consider visiting on weekdays, as the park reaches capacity many weekends and holidays, closing temporarily until sufficient parking becomes available. Visitation is limited to protect the natural and cultural resources, the natural experience for visitors and the safety of visitors. Closure does not affect campers with a reservation. Exploring the park with children? Enchanted Rock State Natural Area is one of many state parks offering Junior Ranger Explorer Packs for checkout. Each free activity pack includes binoculars, magnifying glass, animal tracking key, sketchbook, pencil, crayons and watercolors, guides and a journal. 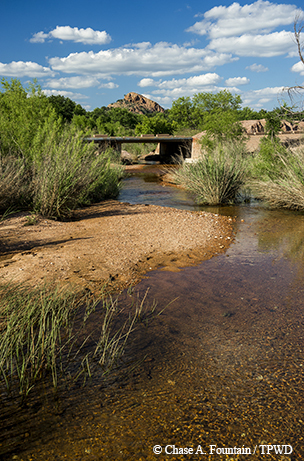 Kids can complete activities to earn a Junior Ranger badge or Enchanted Rock patch.